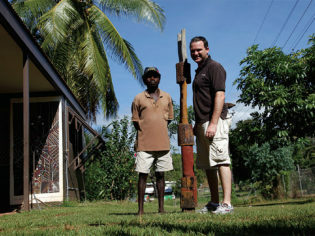 Quentin Long and Pedro Wonaeamirri pose with a Jilamara Art Centre pukumani, or burial pole. WARNING: Aboriginal and Torres Strait Islander readers are warned that the following may contain images and names of deceased persons. It is the greatest Australian journey. I can say that, because I am one of the very lucky few who will ever go. It irritates me when people say they prefer to go overseas for the culture. Ahhh, the kulcha of sitting in a Kota bar in a Bintang singlet singing “Khe Sanh”. There is so much unique, unexplored and unexplained culture in Arnhem Land it makes the British Museum look like a thimble of trivial knickknacks. Okay, that’s probably going a little far but you get the idea. Confronting and enriching, there are few more personally rewarding travel experiences in Australia than an outback art tour. Looking at the art is just one element of it; peering closely at your own intellectual limitations and biases is another. Hopefully you’ll emerge with a greater understanding of many things, yourself included. It’s simply amazing. But never easy. I managed to talk my way onto a private art tour. Seven days, six nights, eight art communities, bouncing around Arnhem Land on a private, small-aircraft charter. It sounds more glamorous than it is. Have you ever been in a tiny eight-seater Cessna after being parked on a tarmac all day? I can tell you – it’s not fun. It’s like sitting in an oven. After a full day of activity, add the remnant humidity of the wet leaving and the dry coming, I sometimes felt I should bring a towel, it was that sticky. Then there’s the bouncing around in the troopies. Beaten up by the fierce ruggedness of the outback, these people carriers – the true camels of the outback – would probably have PETA up in arms if they carried animals. But people? Nah, that’s all good. How the enigmatic, joyously positive and ever happy 80-year-old widow Queen Tup (a fellow art tourer, she’s Ann Cole on the census, but forever Queen Tup to me) handles it with such ease puts me to shame. It was hard and I loved it. I feel so damn lucky to have been there, met the artists and shared the landscape accompanied by some terrific people – and then understood so much art and culture. I almost feel like one of those knobs at a dinner party who’s always one-upping everybody with their “if you think that was good, you should have been with me when” stories. But only almost. Because you really should have been there. I love mimi spirits. The mimi spirits, as I like to think about them, are the spirits who were here before the Aboriginal people and kindly taught them all their lore, law and how to live. These funny little guys live in rock crevices, mostly because they are so long and thin the wind will break them. Poor little guys. Then there’s the mischievous side of the mimi spirits. This I can connect with. The mimi spirits will make noises behind you to spook you. Change the trees to try and get you lost. Like most things in life, they will have fun but are not inherently bad – or good for that matter. They’re pretty positive spirits who the Aboriginal people have a lot to thank for. I first meet my own mimi spirits at the most beautiful panorama in Australia – Gunbalanya (or Oenpelli) on the last day of the tour. I’d left the art centre to capture the most amazing landscape in the world – the permanent billabong, Injalak Hill and the Arnhem Land escarpment rising in the west – when I started to freak out. What’s that rustling in the long grass – is that a crocodile? Is that something walking behind me? I took a few steps back. Those mimi spirits were having fun with me. Then there were the strange noises among the waterlilies. Ah, the Yawk Yawk – mermaids in western lore – were having a lend of me as well perhaps. And on my seventh day, I did not rest. I couldn’t. Those mimi spirits were going to see to that. Six days earlier, we started our tour on the Tiwi Islands, just 80km north of Darwin. The two islands that make up the Tiwi, Bathurst and Melville, are referred to by the tourist agencies as “the island of smiles”. And they’re right: everyone I met was happy and all smiles. I love the feel of Tiwi Design Art Centre on Bathurst Island. Vibrant, fun and full of happy people. Mary Josette Baptiste, one of the celebrated artists for the centre, is at work on a bench when we arrive. Her more famous mother, Jean Baptiste Apuatimi (JB to her friends) is also at work nearby. Mary Josette cradles a small wriggling child while she works, applying her comb to another masterpiece. Every time I try to take a photo, the wriggling child makes the peace sign at me the wrong way round. I start laughing. The entire room joins in. Mary Josette assures me he means no offence and shows him the right way round. It was a shared “kids do the darndest things” moment. Over on Melville Island at the Jilamara Art Centre I meet Pedro Wonaeamirri. He’s a proud man, who wants me to know he has a massive collection of pukanami (burial) poles at the NSW Art Gallery. I know he has some at GoMA in Brisbane as well. Chairman of the Art Centre at 37, he’s a very senior man in a much younger man’s body. He’s also the protégé of the centre’s most celebrated artist, Kitty Kantilla, who seems to have instilled in the community – and most importantly its senior men – a sense of identity, pride and confidence. Pedro blows me away, along with my naïve assumptions, when we discuss the difference between an anthropological appreciation of the artworks and their artistic merit. Yirrkala, on the north eastern-most tip of Arnhem Land, is an astonishingly beautiful part of Australia. It’s also a political hotbed and the Church Panels are their centrepiece. Check out the full story online; it’s a feature in itself. 1. How long have they been operating tours? This will determine their relationship with the art centres, the effort the centre will go to in providing access and specialist attention. 2. Do they really know their art from their touristy gimmicks? Be prepared to do your own research about the art centres so you can ask questions to test their knowledge. 3. Is there a specialist Indigenous art expert on the tour? This is essential for getting real context and quality information. 4. Do they take a commission on art sales? This can be problematic in determining which communities you visit, the price you pay, or the quality of the work you are shown. “There is no word in Yolngu for thankyou. It’s not necessary, because if I ask, you must give. It’s how we survive,” says Will Stubbs, who, among other things, is the coordinator at Buku-Larrnggay Mulka Art Centre here in Yirrkala. Will is in the middle of a two-hour monologue that is melting my mind. The intensity of information about a culture so removed from mine is turning my synapses to mush. It’s impossible to absorb all the concepts. This one I didn’t miss. Or the way he talks of the culture both as an insider and outsider. The duality is understandable. Will has been in the Yirrkala community for 15 years – he married a local Yolngu woman – and now he’s the single best person to interpret the cultural context of the art. It still stretches my melon to breaking point and it’s only midday. Will continues to describe the nature of the piece. Fire is also a comforting domestic hearth. Fire is also transformational. After a human body is burnt, the limbs are shorter and come to resemble the crocodile. Hence the moiety fire is connected to the crocodile. The work somehow looks like fingers of fire reaching into the sky and crocodile skin all at the same time. At this point my brain explodes . . . I liked the work when I first saw it. With this insight from Will, I now love it. The artist, who happens to be at work outside the gallery, sitting in the space between the buildings, largely ignores me as I watch her rhythmic strokes, applying more fire to the crocodile skin. It’s comforting to me. I’m not sure she cares. The beauty of the art centres is manifold. They’re great for the artists. The centre will pay the artist either in full or 50 percent of the value of the work right then and there. This means collectors and purchasers can feel confident about authenticity, and that the money is heading to the right places. Also, the works are far cheaper at the source since the gallery isn’t taking its commission. A certain rhythm to exploring the art centres emerges over time. The first hour would be a slow poke around the shelves, walls and hanging cupboards, pulling out a few works here and there. After about an hour a certain few works begin to lift to the top of consideration. A discussion of their merit and the artist’s skill and heritage would evolve. Slowly your eyes adjust to the art. Hidden elements emerge. You begin to see. Gali Yalkarriwuy Gurruwiwi is more of a dude than The Big Lebowski could ever hope to be. A slight 67-year-old with a wild shock of white hair and beard, he arrives at the Elcho Island Art Centre just like a dude, shuffling in with the languid walk of a relaxed athlete. He’s wiry, and can still lift his Morning Star poles in energetic ceremonial dances. Gali was taught the Banumbirr story by his father when the family was moved into the Mission after the war. His father told him that Banumbirr was the brightest star in the sky, rose in the east, crossed all the Yolngu clan’s lands and set just before dawn. But the missionaries were giving Gali a very different story of a small guy from very, very far away. In a sermon, the missionary said to pay attention to the prophets “because it is like a lamp shining in a dark place until the day dawns and the light of the Morning Star shines in your heart”. Gali concluded the Banumbirr must be true because it’s also spoken of in the Bible. His peace comes from the merging of two worlds. Elcho Island is one of the most positive art centres we visit on our tour, led by Dion Teasdale who is shaping one of the most innovative, progressive and successful art centres in Arnhem Land. Mavis Ganambarr and Judy Gurruwiwi are at the centre when we arrive. Mavis is a skilled weaver who famously collaborated with fashion designer Lisa Gorman. Throughout the afternoon, she and Judy are preparing the pandanus for weaving. It’s a long process. The pandanus was harvested the previous day. A root is dug up for dye. Judy methodically strips the pandanus into finer and finer threads. Another plant fibre is rolled on Mavis’ thigh, with three strands forming the bush string. The process goes on and on and we’ve not even started the weaving. The rain came in; the last of the wet, wringing itself from the clouds. Ramingining is a very different place to the others we’ve visited. Hiding inland among the tall acacias and eucalypts, it’s the only art centre not on the coast. There’s no horizon line and no blue. It lacks the space and openness I associate with Arnhem Land and, on a dull day like today, makes me uncomfortable. Must be those mimis having their fun, or are they warning me? The Bula’bula Arts Centre was history making in its time, being the first purpose-built art centre and flourishing through the 1990s into one of the most important in the area. Today it needs some TLC. Vivien finds a magnificent work, the Wagilag Sisters, a creation story, by Philip “Pussycat” Gudthaykudthay (pronounced g’day-k’day). You may know him better as the sorcerer in the 2006 film Ten Canoes. The complete cast were from this area. A legend in the arts world and his own community, he’s a true-life sorcerer (“cleverman” is a closer translation) and wakes every morning and paints or hunts. 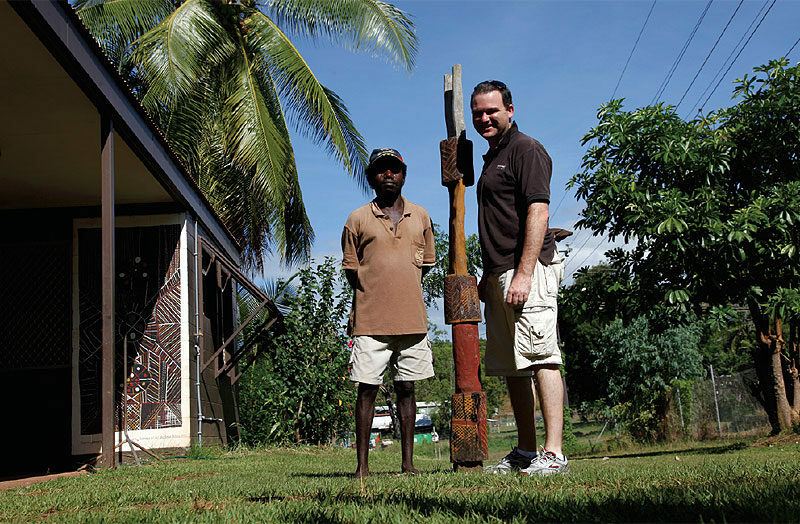 One of the most significant artists of the Maningrida area, John Mawurndjul’s work stands out. He had a meteoric rise to fame 30 years ago. Back then he lived a double life – a man of little standing at home but fêted by white man outside his hometown. When he arrives at the art centre that afternoon he is shy. He says little, answering our questions with his limited English. He wouldn’t be here if not for Vivien Anderson, the Melbourne Art Gallery owner who teams up with Joy Eggenhuizen of Aboriginal Art Connections to put on this chartered tour. The honour is all ours. Mawurndjul has had solo retrospective shows in Switzerland and was commissioned to create works for the opening of the prestigious Indigenous gallery in Paris, the Musée du quai Branly. He’s a serious artist in the rest of the world. Few would know him here in Australia. Our final dinner on the road is at the Maningrida Barra Lodge. Cocktails are served on the spacious deck, watching the slow descent of the sun over the distant Liverpool River and plains. It’s awesome. On the edge of the great Australian savannah, again I feel so damn lucky to be here. Back at the world’s most spectacular landscape, the lethargic heat is balanced by cool breezes. You have to hand it the Aboriginal people of Arnhem Land, they’re pretty smart negotiators. They let Kakadu go, knowing they held the jewel in the crown – the most stunning lands in all of Australia, and the Hope Diamond of Arnhem Land: Gunbalanya. The township hugs the billabong shore while sandstone hills stand guard over the people. The Arnhem Land Escarpment rises dramatically like a wall to the west. It’s so vivid, throbbing and prelapsarian. At the Injalak Arts Centre, Glen Namundja, John Mawurndjul’s brother, doesn’t indentify himself as John’s brother – merely that they shared a father. He sits on the cement verandah on one side of the centre in his own space, away from the other men, painting. The women are on the other side of the building, weaving. It works for him. He is slowly and methodically drawing his rarrk (cross-hatching) on the bark. In three strokes a tiny, perfect, continuous line appears, then another one exactly parallel to the last. Then another. This will be repeated thousands of times to finish a single work in two to six weeks. It’s as much a trial of patience as it is dexterity and skill. The final dinner in Darwin that night is a strange affair. Shared experiences have forged a secret exclusive society that will have dissolved by morning. We are privileged to have met these people, each other and seen these lands. And then we have the works of art to hang. And I have my mimis. So you want to do an outback art tour . . .
People planning to visit East Arnhem Land can now benefit from the online work of the Nhulunbuy based Aboriginal Corporation that develops, supports and promotes indigenous tourism in Arnhem Land: Lirrwi Yolngu Tourism. …its more than destination promotion website, it also share details of the complex story of indigenous tourism development.